Pandas are bears. Bears are, as we all know, omnivores. They’ll eat whatever comes their way, give or take. 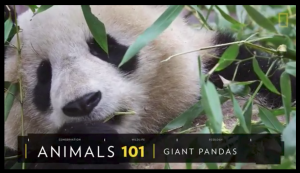 Pandas, however, have dedicated themselves to a wholly different diet of just bamboo. I suppose it could be considered the panda paleo diet. Anyway, the long and the short of it is that bamboo is tough stuff to digest, and to survive on it pandas must eat and eat and eat, to extract all the nutrients they can get. All this eating leads to an equivalent amount of what our Chinese colleague Binbin Li, appropriately calls ‘panda poops’. Basically, they are barely-digested bamboo fragments. When National Geographic called and asked us for panda poop images for a new short video on pandas, we happened to have just the right thing, taken on our last visit to China. They cleverly multiplied one panda poop to a whole day’s production, just to make the point above. Take a look!